A dynamic multisensory interior that takes visitors on a journey from Phillip Island to Antarctica. Marrying form and design seamlessly with multimedia and interactivity; entertaining and engaging the visitor, through exploration and discovery. The client was a partnership between Phillip Island Nature Parks and Word Wildlife Fund for Nature (WWF). The brief requested a dramatic media environment with a conservation message to be delivered in a 1000sqm, partially disused visitor center on Phillip Island. The center was to be developed into a pay to enter attraction that would provide visitors with a unique media rich immersive experience worthy of driving 200km from Melbourne to see. The center needed to be contemporary, use cutting edge technology and handle up to 1000 visitors per day. The project team brought together the disciplines of architecture, interpretive design and multimedia to produce a truly integrated and dynamic public interior. The exhibition references themes of the oceanic, jagged basalt shore, ice and sky as the conceptual drivers for stylised forms, the spatial layout and materiality. The space combined soundscapes, mapped large-scale projection, triggered and responsive augmented reality through which visitors can activate and explore the experience with all of their senses. The center needed to both entice and engage visitors whilst also providing an overlay of understanding of the conservation issues and how the WWF and Phillip island Nature parks are working to preserve and support the Antarctic ecosystem. The project contributes to contemporary interpretive design practice through its focus on the visitor and its successful integration of architectural built form, and interactive experiences that encourage personal agency and activism. 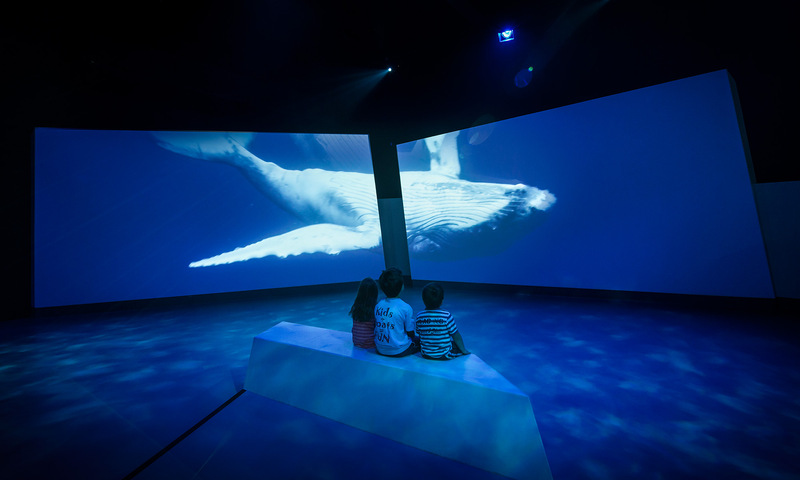 The interior provides a virtual experience that is packed into a carefully constructed self directed, navigable interior landscape, where the visitor is immersed in the Journey to Antarctica, encountering unique species and their conservation issues. Through a personal visceral connection to landscape visitors gain a greater understanding of the ecology of this fragile environment and how their personal choices can effect positive change. The choice of materials included: sustainable timbers, metals, glass and plexiglas plastic all chosen for their recyclability. Sheet materials used were zero formaldehyde. This project exemplifies the tight integration possible between architecture and interior design with the media and exhibition experiences. In the journey space the screen forms reference icebergs and floes. Visitors move between these forms onto which panoramic videos of life above and within the ocean are projected. Further outcrops define spaces and provide spaces to rest and observe. Within both the public entry spaces and the lab space the joinery forms and walls are in keeping with this language of angular fractured geometric forms. As the visitor journeys through the space they navigate a dynamically structured environment. The project was delivered in collaboration with Terrior and Mental Media.